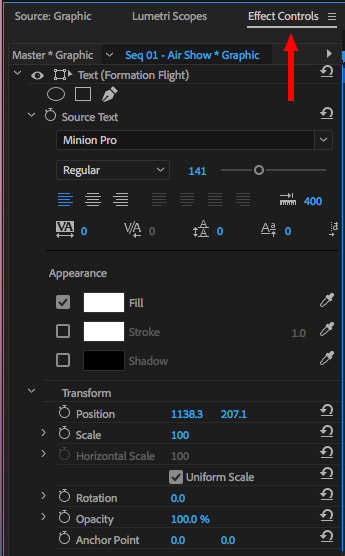 One of the more obvious – but entirely welcome – new features in the 2018 update to Adobe Premiere Pro is the new Fonts menu. FIRST NOTE: I think this new menu also appears in After Effects. SECOND NOTE: To learn more about fonts in general, see this video. 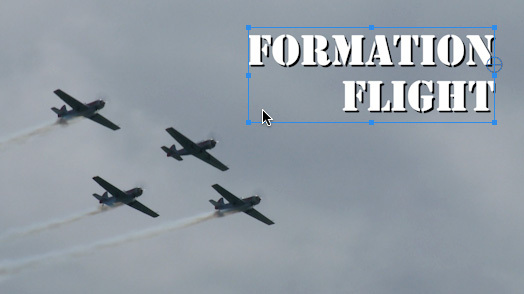 I enjoy using typefaces and created an entire webinar devoted to them here. For example, here I’ve used the relatively new text tool to add a title directly in the Program monitor. The text isn’t bad, really, but it certainly doesn’t seem to be, um, soaring with military precision. But why do something you already know when you can learn something news? NOTE: If you want to get a jump on this tutorial, change the font and you’ll immediately see this new feature. While the illustrations are a bit small, even these hints can be really useful in finding the right font to convey the emotion you want for your project. 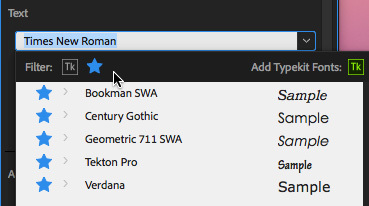 Twirl down the small right-pointing arrow to the left of the name of the font to see all the different weights available inside. See those stars on the left. These allow you to select Favorites, as I’ve done here for Tekton and Verdana. 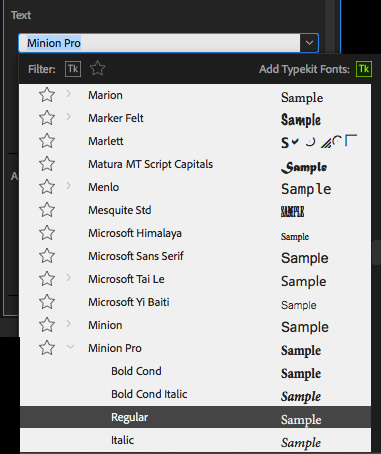 One of my BIG frustrations in any software is navigating a long font menu. I love fonts and try to use different ones in my projects. But it is really painful scrolling to the bottom of a long font list. Which means that I owe an apology to all fonts who’s name starts with any letter later than “L,” because I have ignored them for all the wrong reasons for far too long. Especially because we can’t type a letter and jump to a font beginning with that letter. We have to scroll… and scroll… and, sigh, scroll. 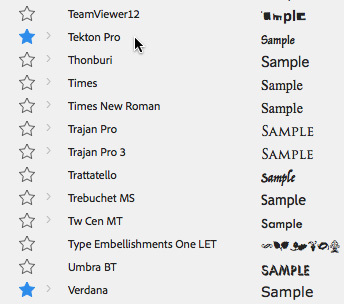 Instead, once you’ve starred your favorites, click the star icon up in the Filter bar and all your Favorite fonts are isolated and displayed, regardless of where they occur in the overall font list. 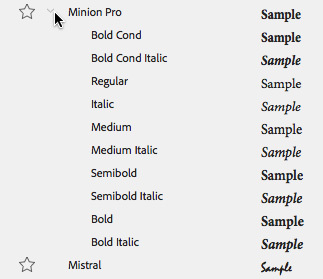 Even better, if you’ve downloaded some Typekit fonts, you can quickly see which those are by by clicking the Tk icon. NOTE: To remove a filter selection, just click the icon again to deselect it. 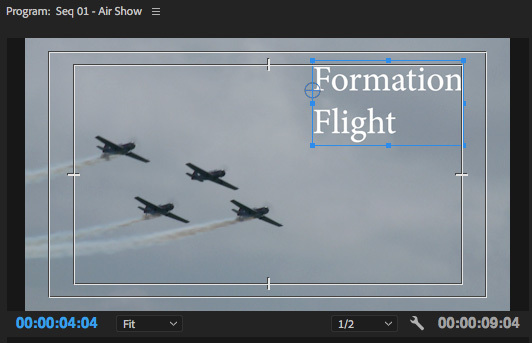 It seems like a small thing, but the new font menu in Premiere makes using ALL your fonts a lot faster and easier. where is the underline option?? Good question. I just looked and it does not seem to be readily apparent. did you every figure this out? having the same issue right now. certainly they wouldn’t have left out such an important and basic option right? To underline font, you need to create a legacy title. Fonts are a system-level resource. Upgrading Premiere would not have affected them. Upgrading your operating system might. Yay! That Favorites filter is a terrific tip! One question: if I’m in the text tool and I type V to get the Move tool, the keyboard shortcut doesn’t work. The type tool dutifully types a V in my text. Is this simply the way it works, or is there some configuration change I can make to re-enable keyboard shortcuts? Should I press a modifier key or something? This is the way text is supposed to work, otherwise there would be no way to type “victory,” as it would keep jumping out of text mode. Deselect the text box, then all your keyboard shortcuts will enable. 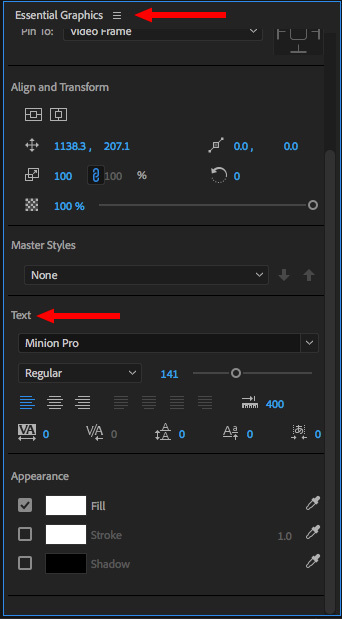 How do I set a “default” font in Premiere Pro CC 2018 v12.1.0 (Build 186)? Every time I go to do any type of font work in Premiere Pro, it, by default, loads this extremely, almost unreadable, bizarre font. Now that tells me that, somehow, somewhere, that bizarre font is assigned to be the current, “default” font. I don’t know a way to set the default font and a quick Google search did not turn up anything either. Time to call Adobe Support. Font favorites don’t seem to work correctly for me. Right after I click the star I can see it in the favorites filter, but then it’s not there when I edit a different type object. For some reason, I am able to change the fill and stroke color within the Essential Graphics panel, but the text itself is not changing color. It remains black. Any thoughts? Text colors are changed from the Character pane, Fill and Stroke are used to change Shape colors. Adobe now licenses its software via subscription. You pay a small amount for the software each month. As such, you can’t upgrade your 2015 version. Instead, go here to subscribe to the current version. Adobe updates its software multiple times a year under this new system. It depends upon the format of the subtitle. For example, SCC subtitles do not support gray backgrounds. iTT subtitles do. can we change multiple text font with one change? If, by this question, you mean: Can we can the font in multiple text clips at the same time? In Premiere, no. In Final Cut Pro X, yes.